Josh Hamilton's abdominal/groin injury has finally landed him on the disabled list. He underwent an MRI exam on Tuesday but the results have not been conclusive. He either has an abdominal strain which will cost him about three or four weeks on the disabled list, or he has the far more serious Sports Hernia which could cost him two months or more. Sports Hernia specialist, Dr. John Preskitt has prescribed two weeks of rest and anti-inflammatory medication. After two weeks he would probably receive another MRI and a decision would be made on whether surgery will be required. Who knows if this was caused at least in part by the rib cage injury that caused him to miss several games. It seems like an awful big coincidence if it isn't. I am assuming that the series of injuries is responsible for his mostly mediocre performance this season. I know a lot of owners were counting on a worthy sequel to his 2008 attention grabber. The best case scenario is that this is just a mild strain and two weeks of rest and the right drugs is going to be enough. The worst case scenario would involve surgery with an 8-10 week rehab. If surgery is required Hamilton could be out until mid-August. Hamilton owners would be wise to wait this out before entering panic mode. It is still possible that this is just a strain and Hamilton will be fine in just a couple of weeks. I am being optimistic for now. But I would not fault an owner that sold low on Hamilton during this uncertain period. In fact, trading Hamilton to a re-building owner may be the best course of action if you can get a suitable return. However, I plan to wait it out and hope for the best. I own Hamilton at a cheaper price in my primary AL-only and I think my offense would survive the extended loss. 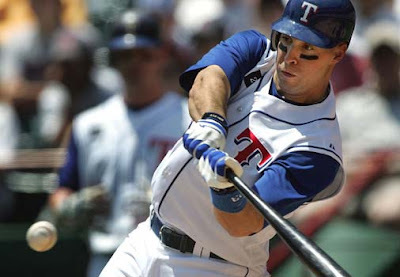 The Rangers have called up outfielder Brandon Boggs to take Hamilton's spot on the major league roster. But I would not expect many at-bats for Boggs. Andruw Jones and Marlon Byrd are likely to get the biggest boosts to their playing time. In shallower leagues where Jones and Byrd are still available, they make excellent pick-ups. In deeper leagues you may need to settle for Boggs or make a deal for a replacement. I wish you all luck, I know I'll need it myself.